There’s something special about being first. The first in flight, first man on the moon, and the first African-American president. First kisses, first impressions, first place. Being among the first in your family to attend and graduate from college is special too. I’m First! 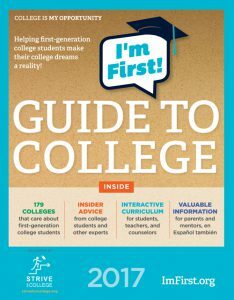 was created by nonprofit Center for Student Opportunity in 2013 to provide students who lack a family history of higher education with inspiration, information, and support on the road to and through college and is now an initiative of Strive for College—a national nonprofit that also runs a national online mentoring program for college-bound students. Hear inspiring stories from first-gen students and grads on, share your own, and read our first-gen student blog. Join Strive’s online platform and connect with colleges that offer special programs and support specifically for first-gen students. Get a FREE mentor to answer your questions about college, and receive guidance through the admissions process.